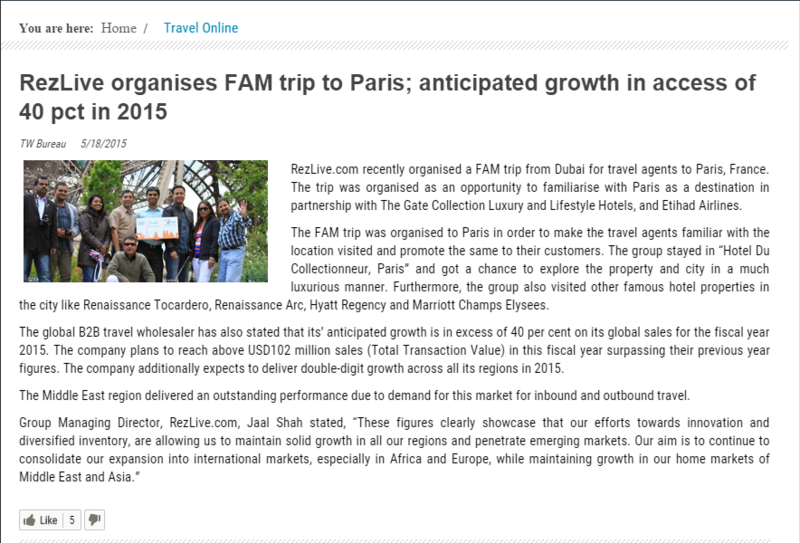 Here you will get the complete details about the latest happenings with respect to Travel Designer Group and all its products. 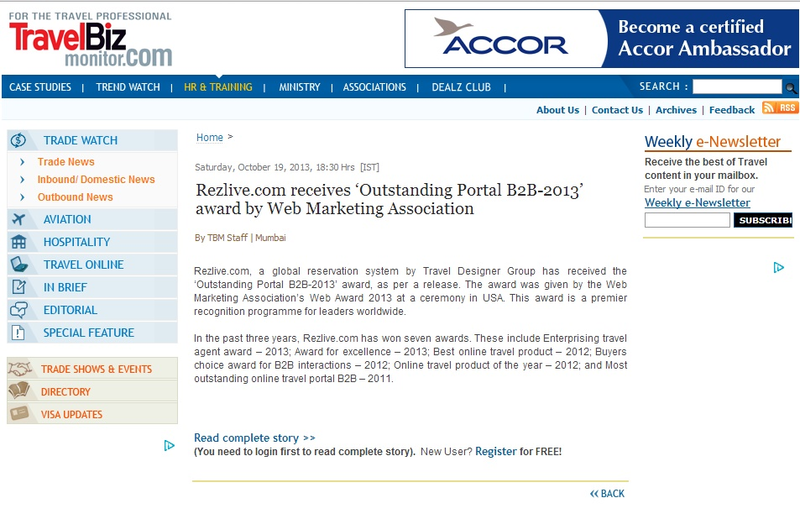 RezLive.com has been honoured by the world travels awards in the category "world leading B2B travel provider." 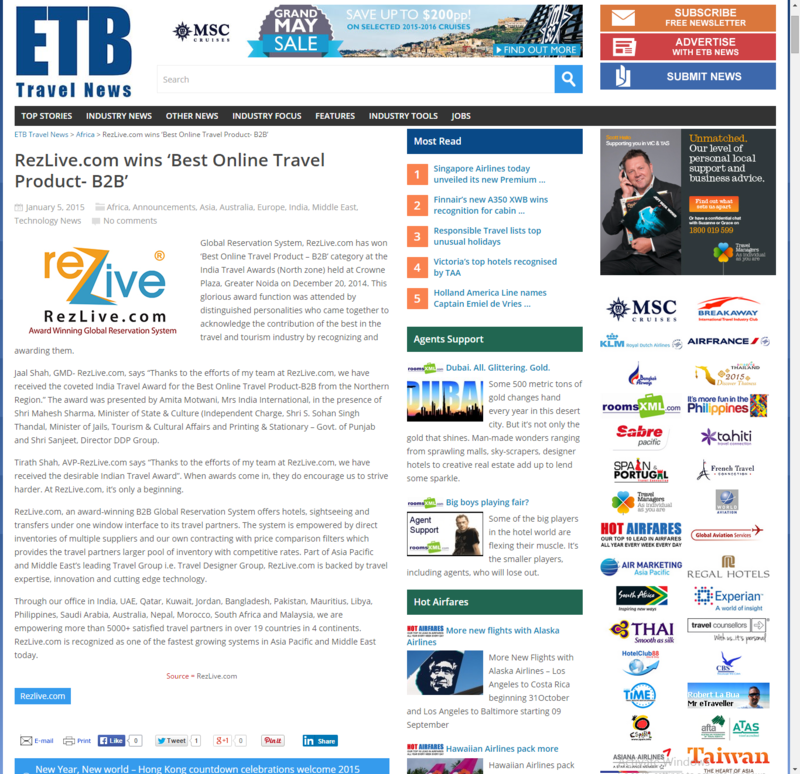 TravelBuzz - Power of Big Data - Are we prepared? 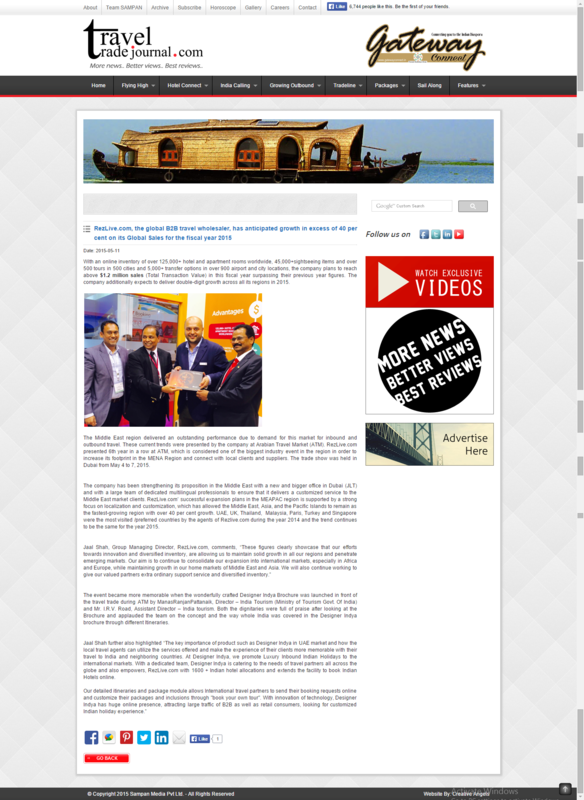 Tourism Marketing Alliance which consist of RezLive.com, BookonBlueStar.com, MSC Cruises & Pearl Tourism and Leisure Group hosted their Roadshow with the leading Travel Agents and Tour Operators of Punjab from 20th August to 24th August, 2018 in four main cities, namely Chandigarh, Ludhiana, Jalandhar & Amritsar..
TMA has organised an event through TEA-Travel event academy. 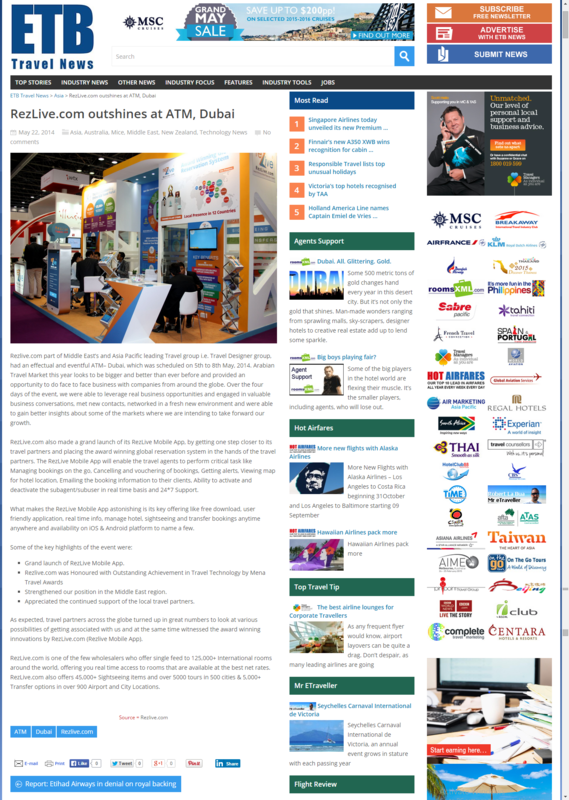 Arabian Travel Market is One of the most popular travel trade shows. We are excited to announce that the Corporate Office of Travel Designer Group has moved to an even bigger and state of the art premises in Ahmedabad (Gujarat), India. 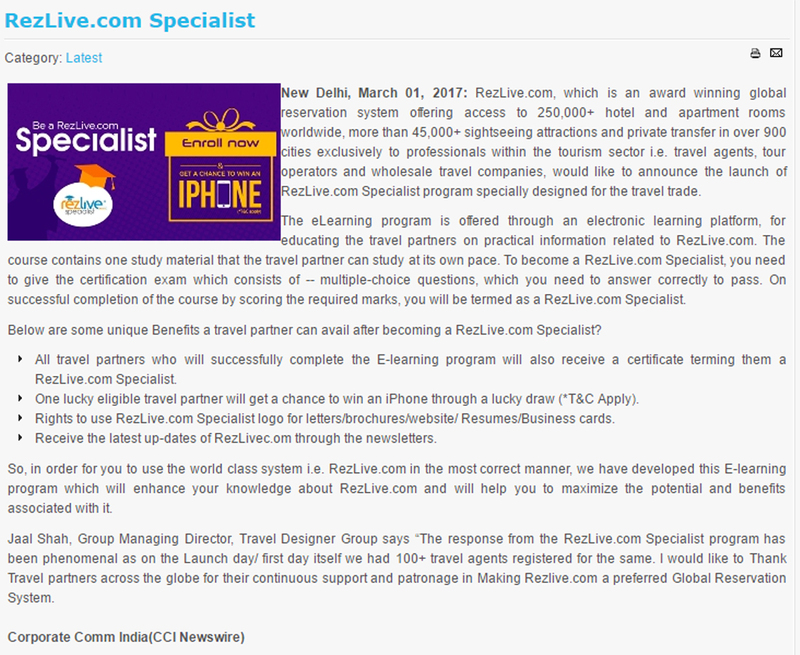 RezLive.com to offer more benefits to partners through the e-Learning programme, as well as rezRewards. 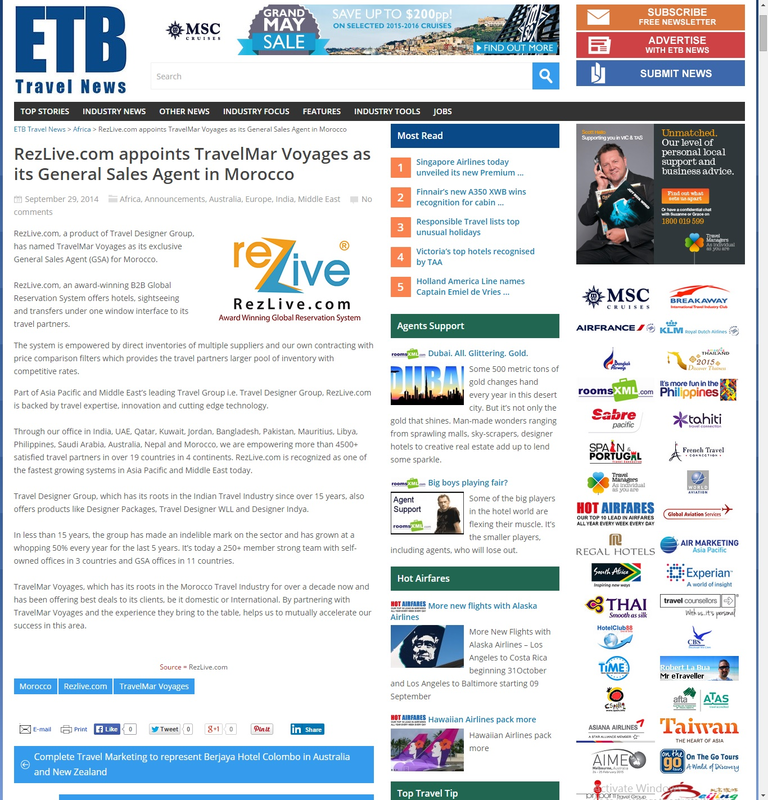 RezLive.com announces the launch of RezLive.com Specialist program specially designed for the travel trade. 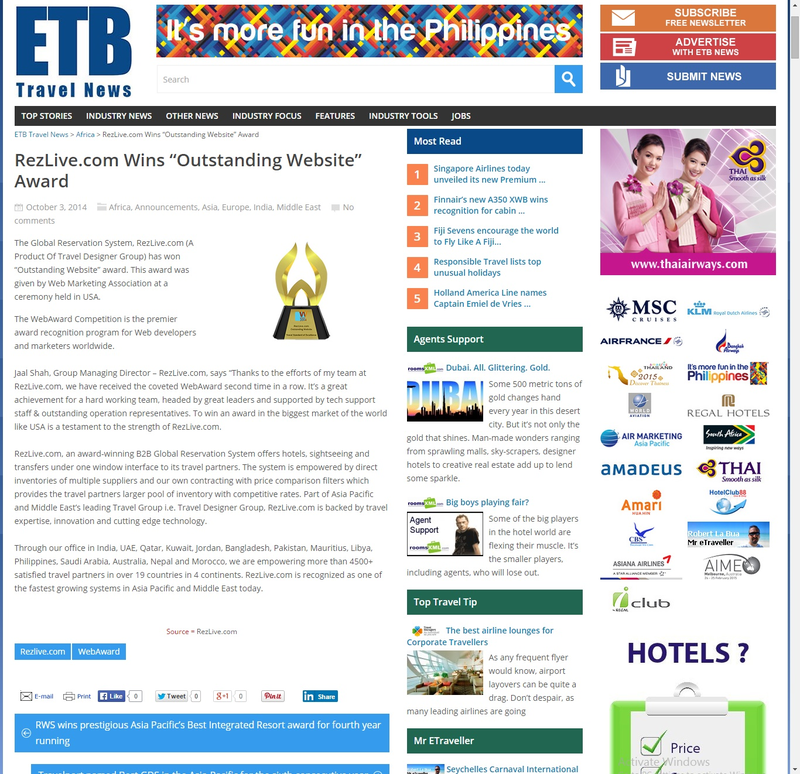 Traveling Made Effortless With A Multifaceted Online B2B Global Reservation System. 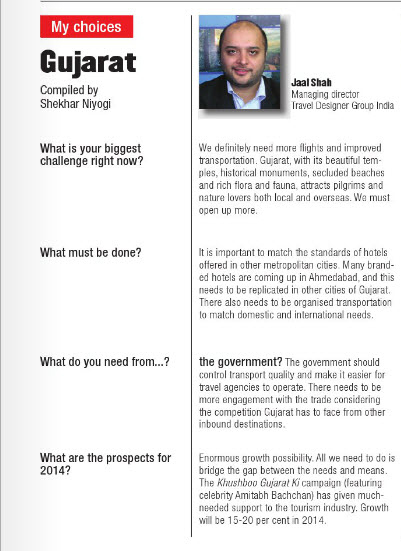 Jaal Shah shares his views on new trends in the online reservation system. 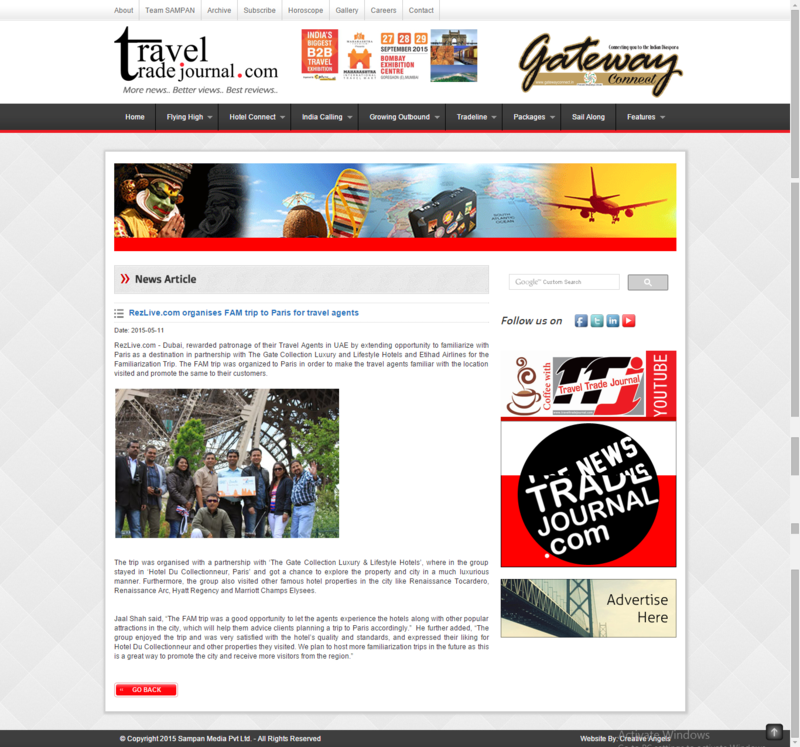 Travel Designer Group brings world at the doorstep of travel partners. 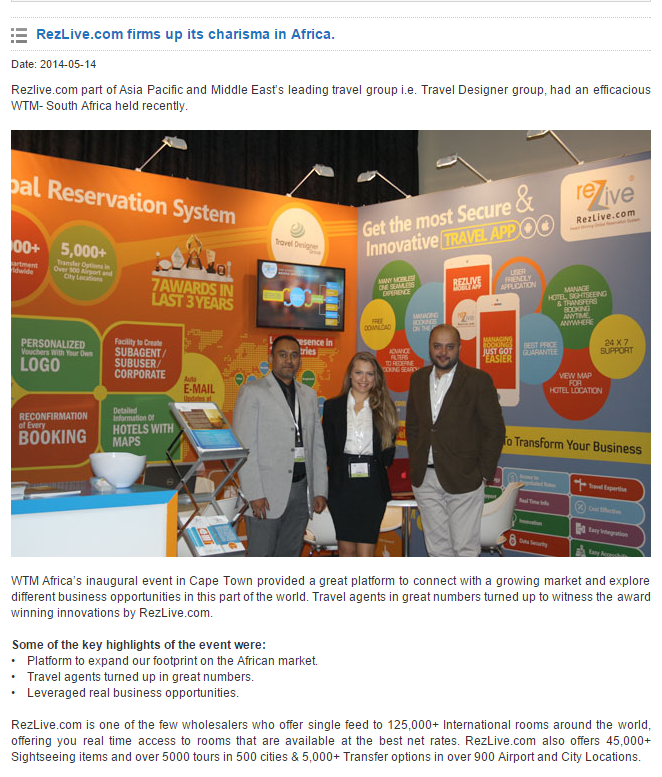 "The Idea was to make the Booking experience of our travel partners supplier and fruitful"
Internet of Things (IoT) is a debatable topic but I believe that everything will be connected. 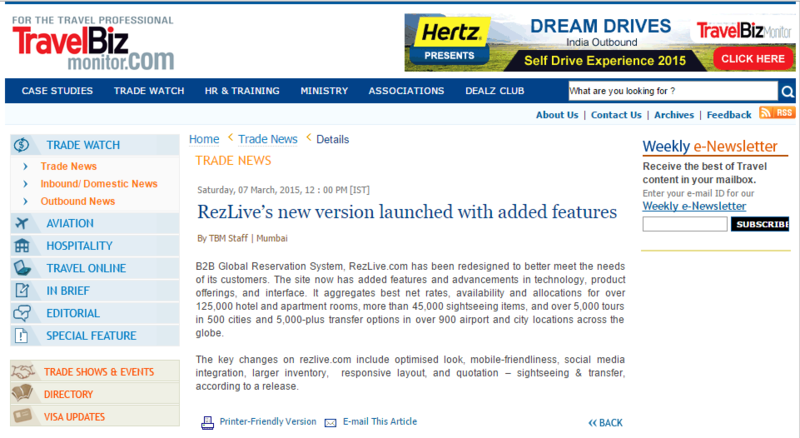 The online booking system has introduced..
To Provide abetter booking experience, RezLive.com has gone through a makeover .. 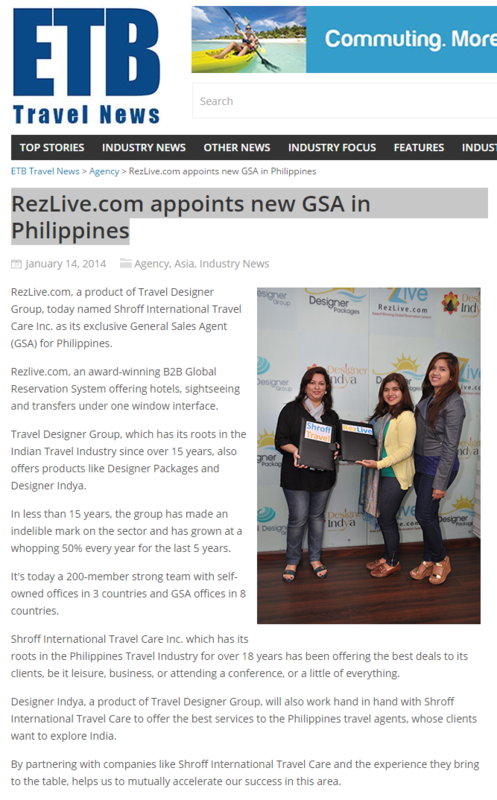 Expanding its reach further in the Asia region, RezLive.com, a product of Travel Designer Group recently celebrated the opening of its new branch office in Bangkok, Thailand. 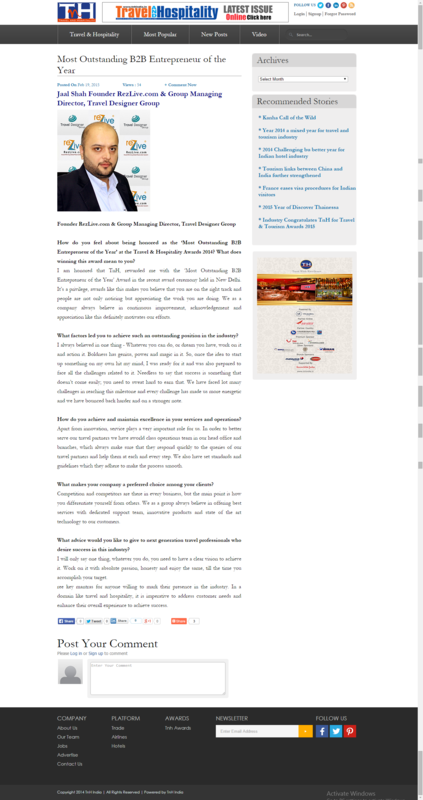 He is a young, dynamic, self-driven and passionate new age entrepreneur. Fellow industry people call him a man with a Midas touch for whatever he touches, seems to turn profitable. 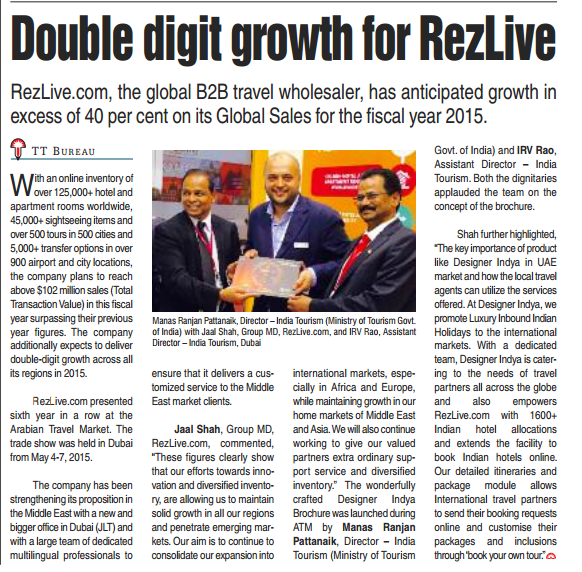 Jaal Shah, Founder of Ahmedabad based B2B online reservation system - Rezlive.com, reveals how Indian hospitality industry is facing a series of new developments, both..
Travelweb in association RezLive.com will be organizing a cricket tournament on June 11, 2015 at United Pro Sports Club in Al Quoz..
Jaal Shah, Founder, RezLive.com, GMD, Travel Designer Group, tells TravTalk about the company's growth, existing products and new offerings. 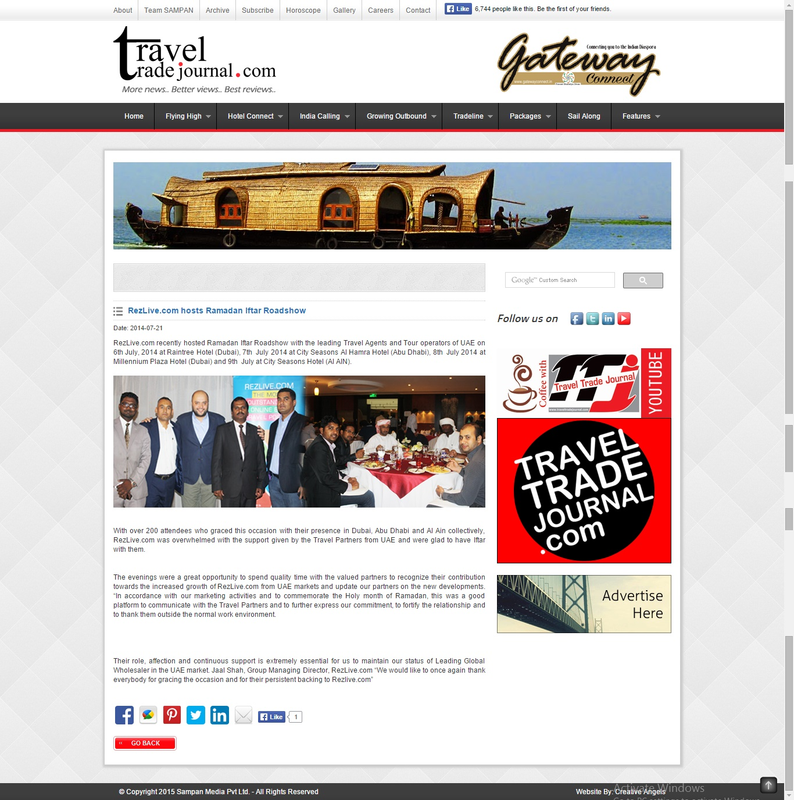 Travel Designer Group on Monday, 6th April, 2015, hosted its Annual Agent Appreciation Event & launch of Designer Indya Brochure in Mumtaz Mahal Restaurant..
RezLive.com has been redesigned to better meet the needs of its customers. 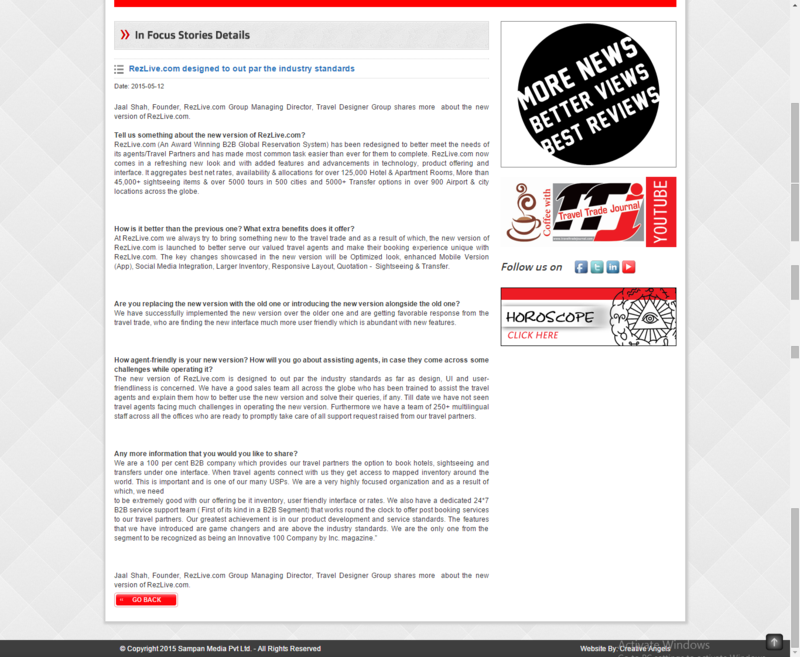 The site now has added features and advancements in technology, product offerings, and interface. 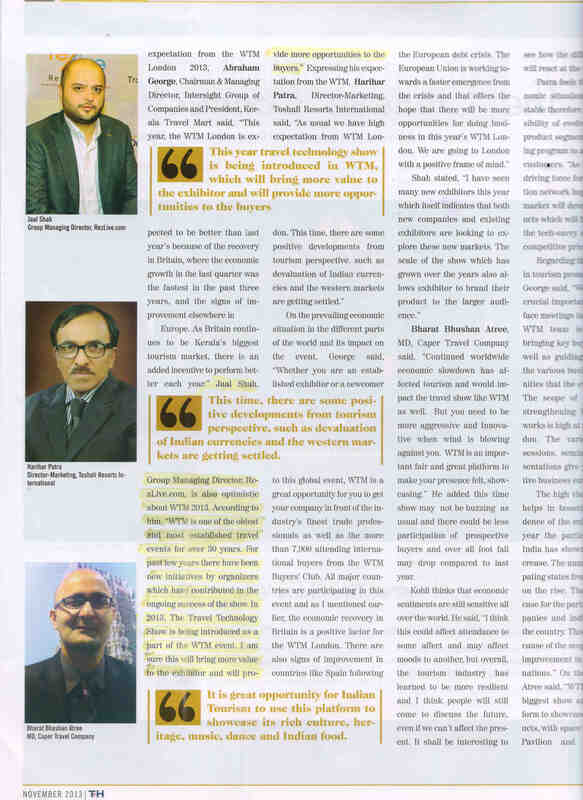 I was a part of small team that started Travel Designer Group way back in 1999 as managing Director. 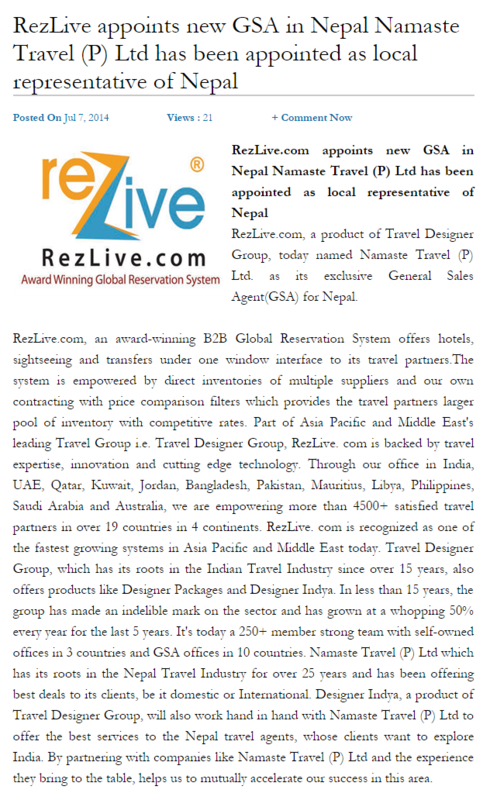 We started as..
RezLive.com expanded its global reach with opening of the new office in Nepal. 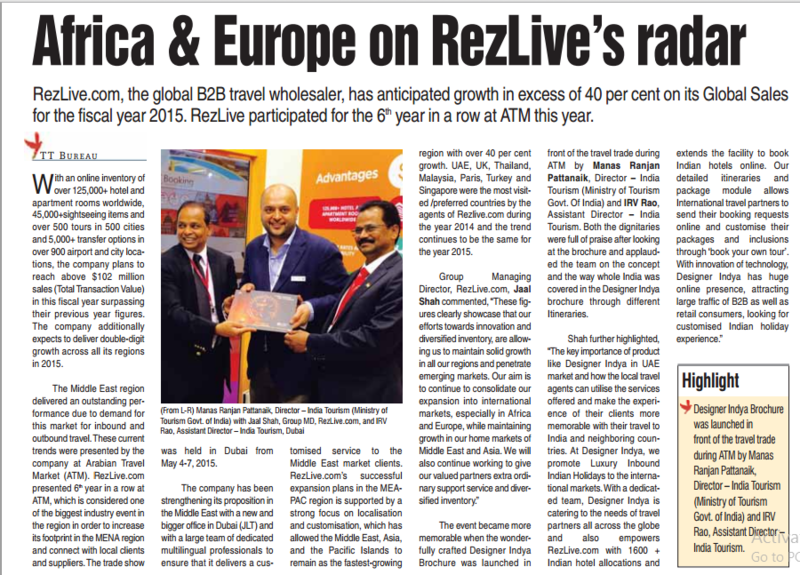 RezLive.com outshines at ATM, Dubai and strengthened its position in the Middle East region. 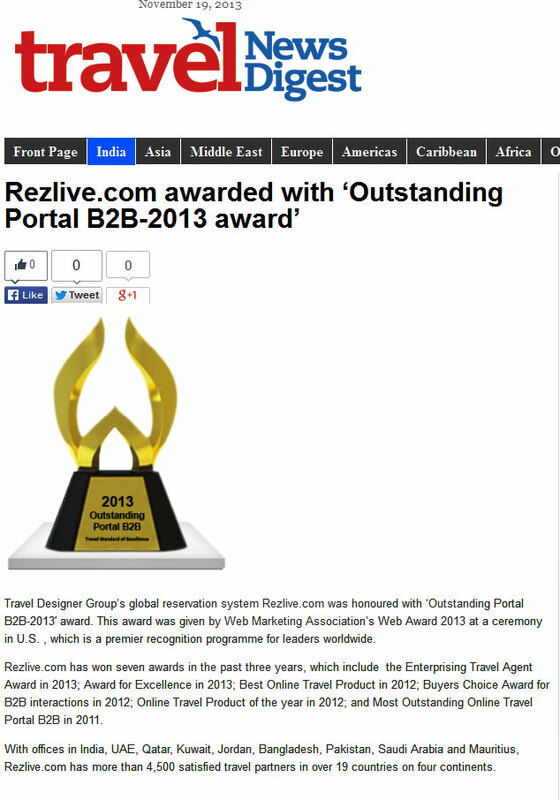 MENA Travel Awards Honoured RezLive.com with Outstanding Achievement In Travel Technology. 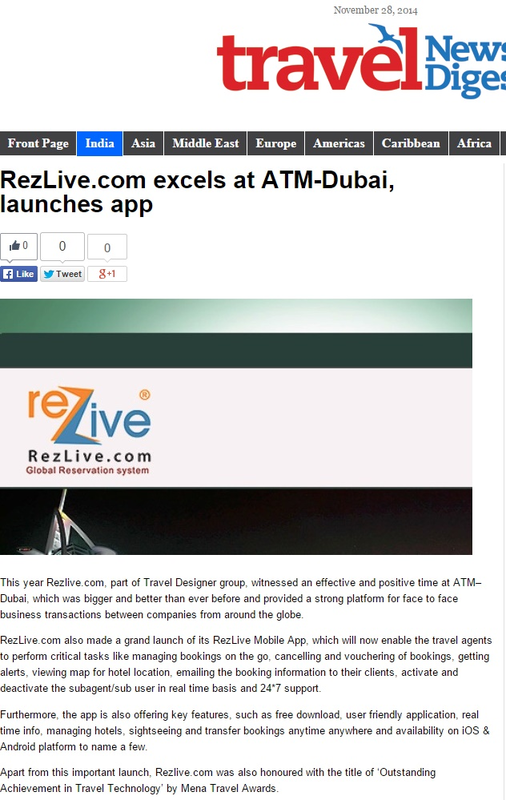 RezLive.com made a grand launch of its RezLive Mobile App at ATM-2014. 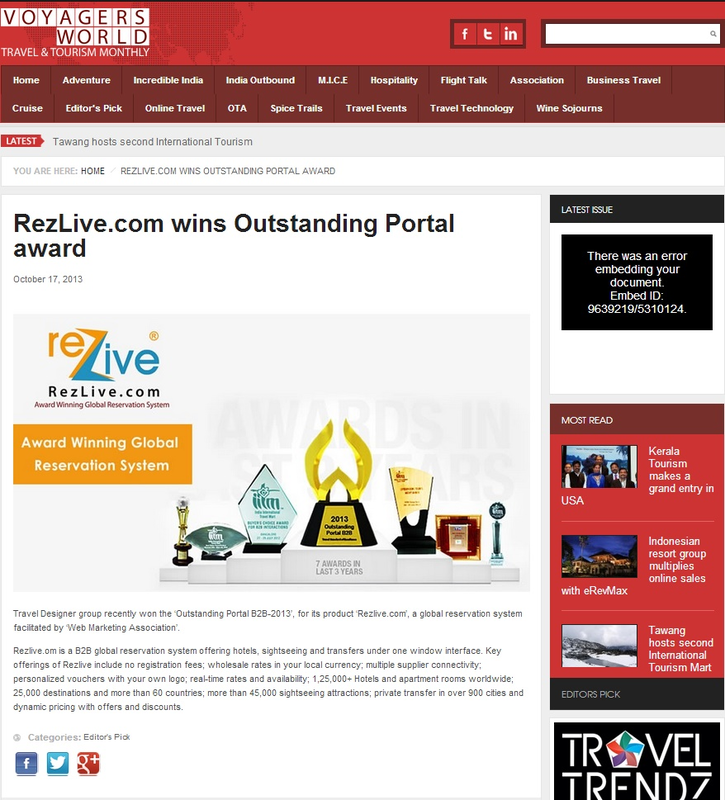 RezLive.com firms its position in Africa because of the overwhelmed response it. 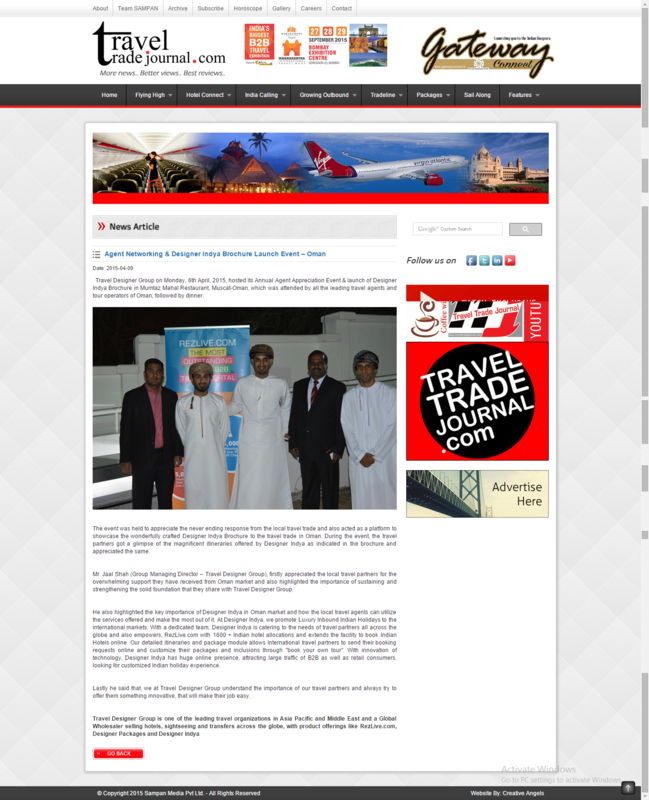 RezLive.com hosts agent appreciation event in Oman. 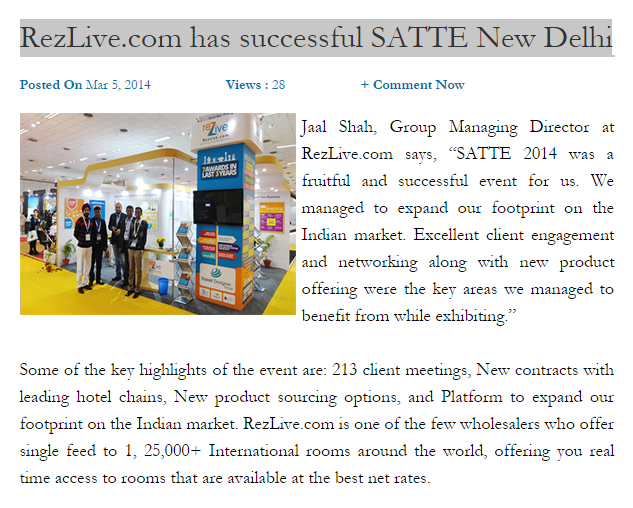 Mr. Jaal Shah's (GMD views on "Demand Pushing RezLive to Adapt Model". 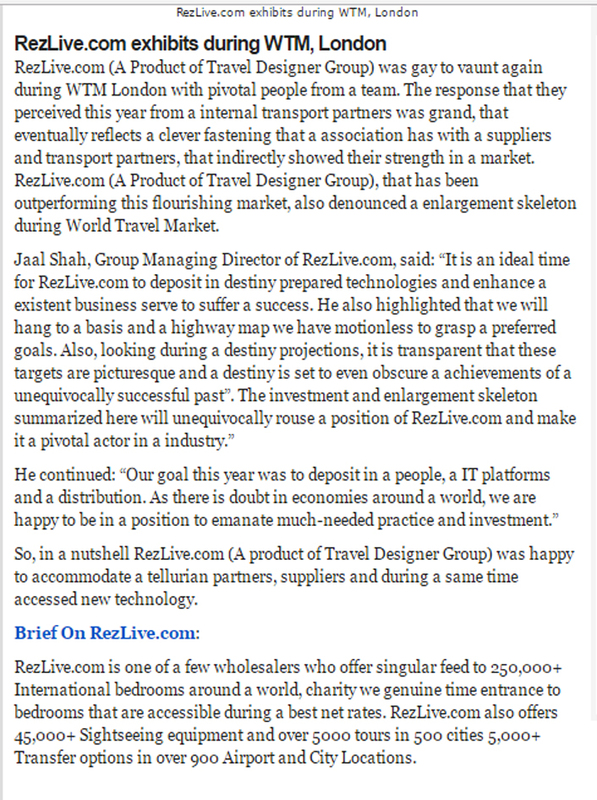 RezLive.com was covered by the most prestigious magazine TTG Asia under the..
Mr. Jaal Shah's (GMD - Travel Designer Group) views on "RezLive.com to expand its reach to tier II, tier III cities". 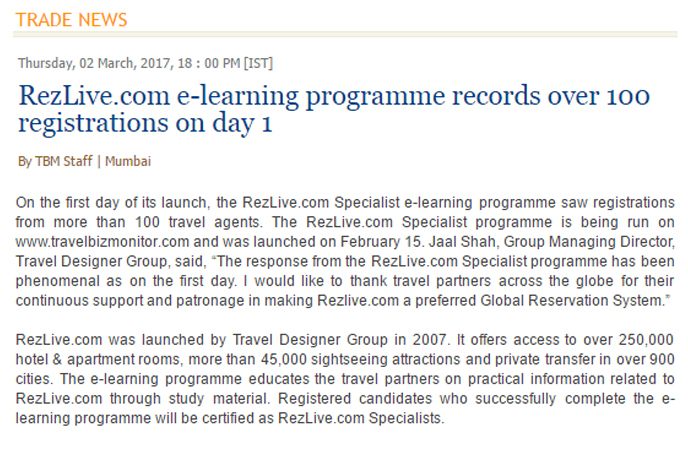 RezLive.com had successful stint at OTM, Mumbai and cemented it's footprint on the western part of India. 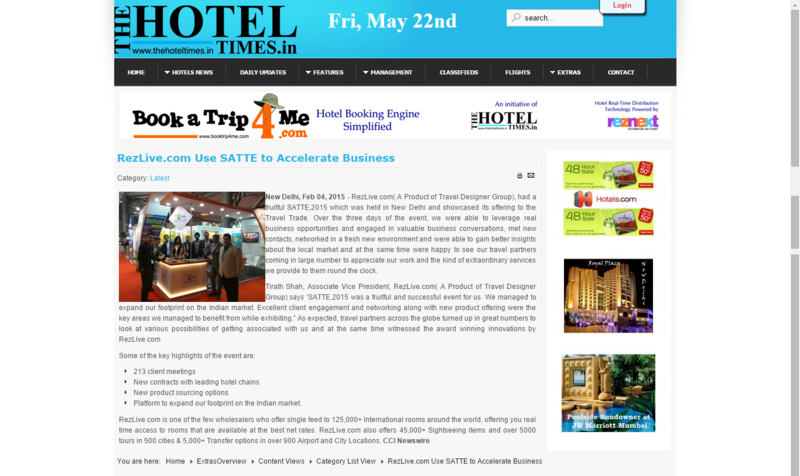 Launch of Designer Packages Website. 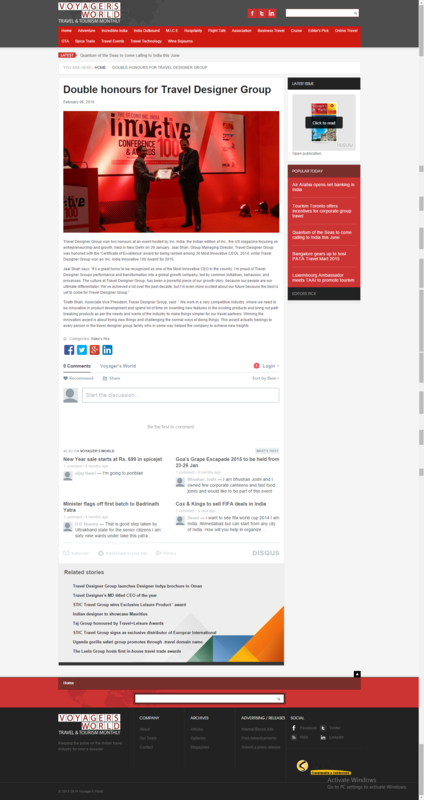 Launch of refreshed Designer Packages Website. 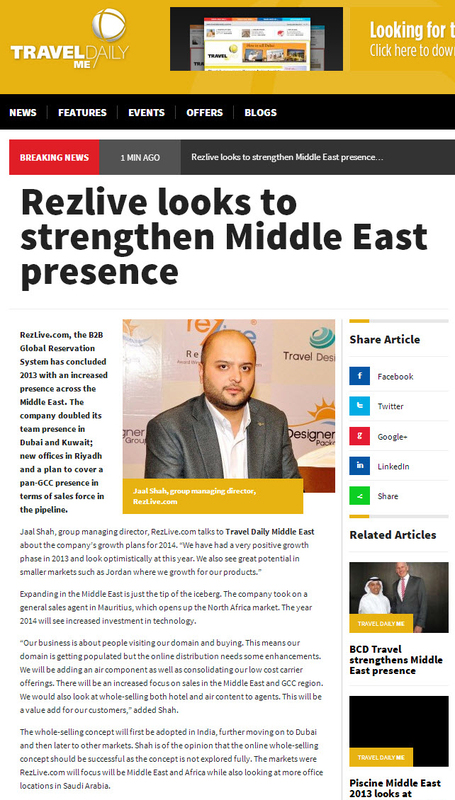 Mr. Jaal Shah's (GMD - Travel Designer Group) views on "Rezlive.com looks to strengthen Middle East presence"
RezLive.com expanded its global reach with opening of the new office in Philippines. 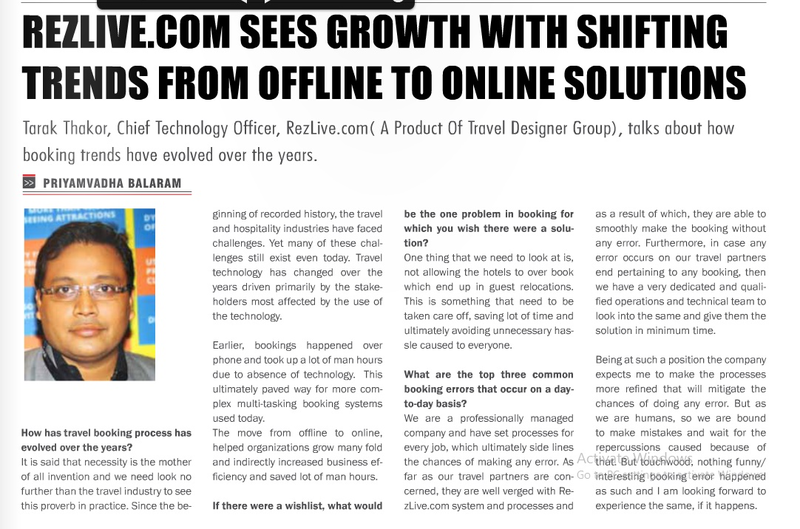 Mr. Jaal Shah's (Group Managing Director - Travel Designer Group) views on "Boosting online hotel sales". 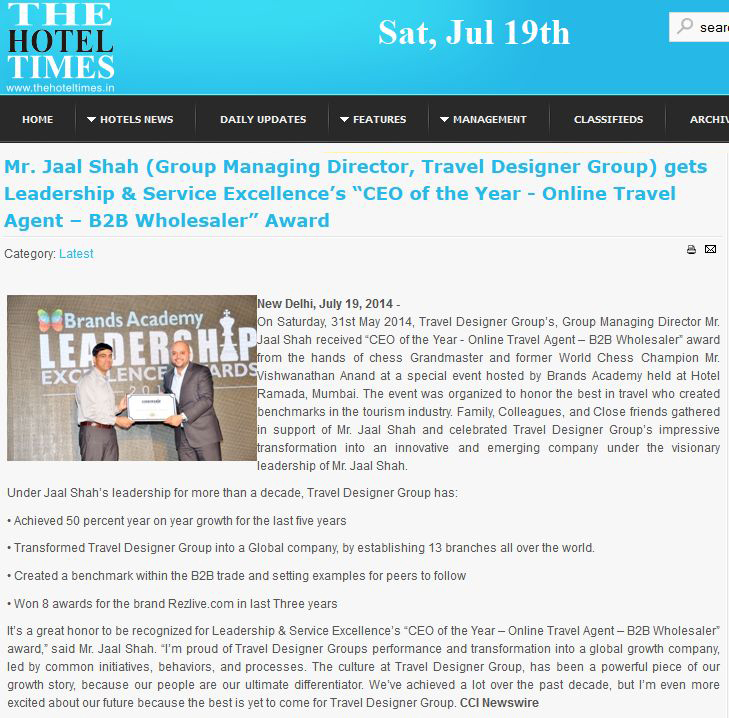 Mr. Jaal Shah's (Group Managing Director - Travel Designer Group) views on "60% of travel will be done online by 2020"
brings to you the leading online travel agents, who spoke at length about the strong growth prospects and the midas touch offered by enhancing safety and security of the onlinetransactions. 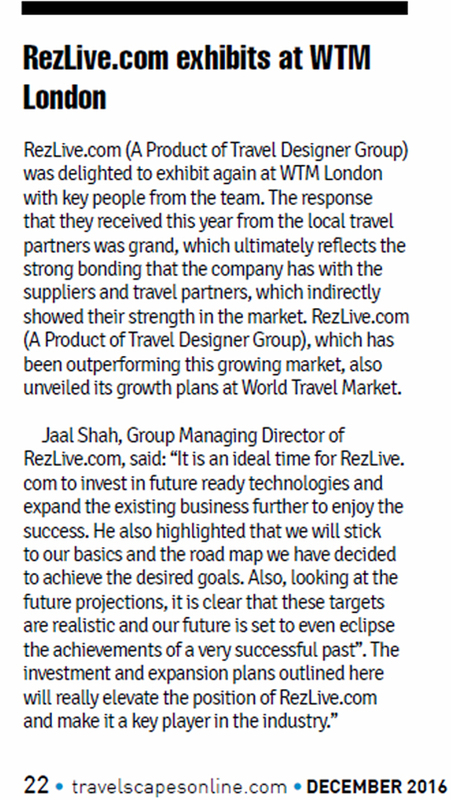 Mr. Jaal Shah's (GMD - Travel Designer Group) views on "Hotel reservation system RezLive upgraded to version 3.0"
Mr. Jaal Shah's (GMD - Travel Designer Group) views on "Rezlive to go live by March 09" were covered in Express Hospitality. 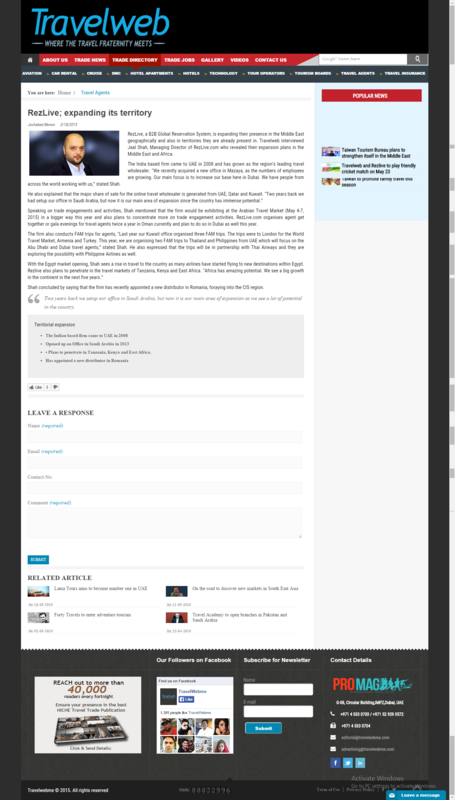 Launch of Designer Indya, Our B2B offline inbound product. 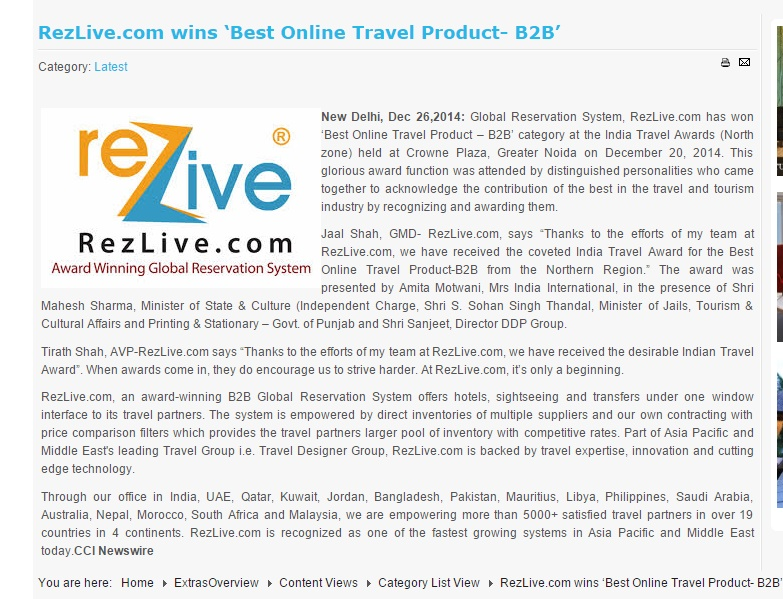 Mr. Kalpesh Shah's (Chairman - Travel Designer Group) views on "Rezlive to integrate domestic hotels in reservation system". 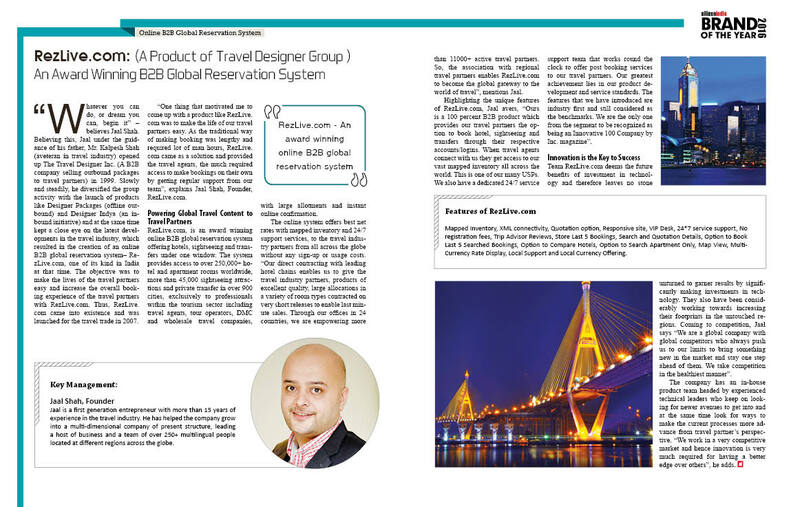 TTDI Became Travel Designer India Pvt Ltd. Introduced Our IATA Accreditation To Group Partners. 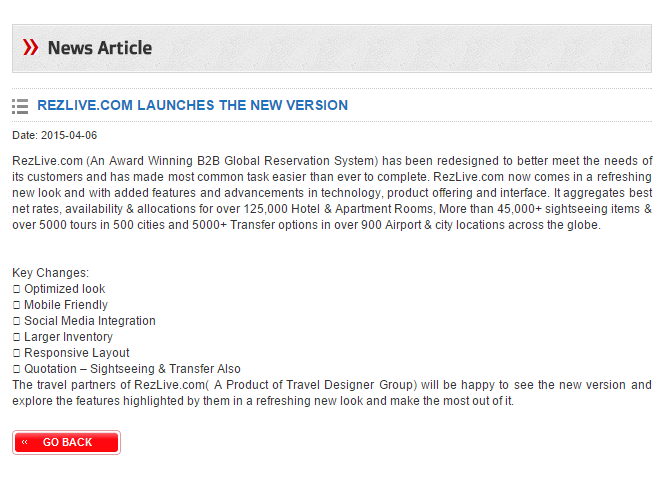 Launch of Designer Packages, Our B2B offline outbound product. 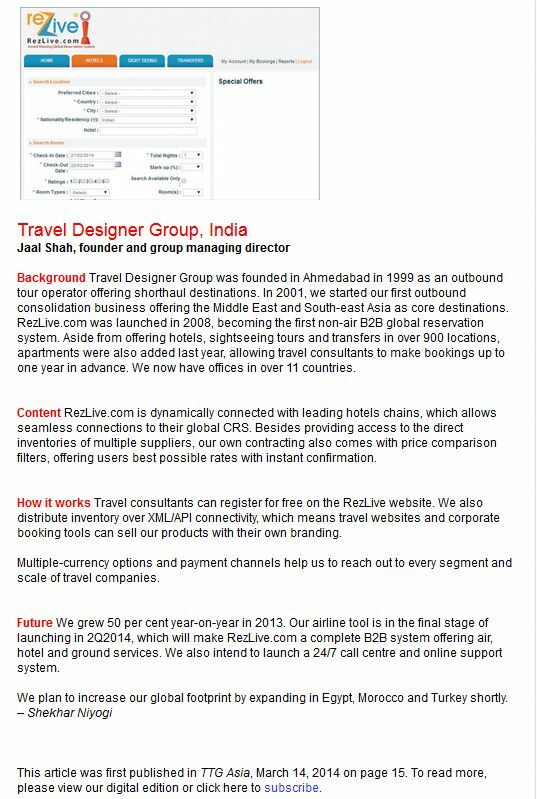 We started our journey as "The Travel Designer Inc".